Listed as No. 26 in the 1911 census, Ellen & John Mansfield lived in this house. Mother and son, Ellen was 72 and John 31 - and John worked as a labourer - both were bilingual. Ellen signed the census document with her mark rather than a signature and the witness was Constable Thomas McGan. 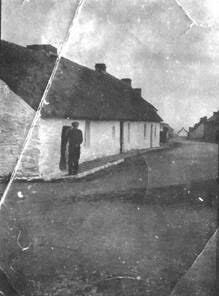 In 1911 the cottage was stonewalled and had a thatched roof. It is marked as a 3rd class house with one room inside and a single window. Ellen rented the house from James Tierney who owned a number of houses in this part of the Main St. Listed as No. 42 in the 1901 census the house is occupied by Edmond (67) and Ellen Mansfield (60) and their son John (27). Ellen is listed as a housekeeper while Edmond is a labourer and John a fisherman. The house is owned by James Tearney in 1901. The census witness is Constable Thomas Hanly. This little house was later demolished, apparently to make room for the swing of trucks or buses coming into the village from the Dungarvan side.